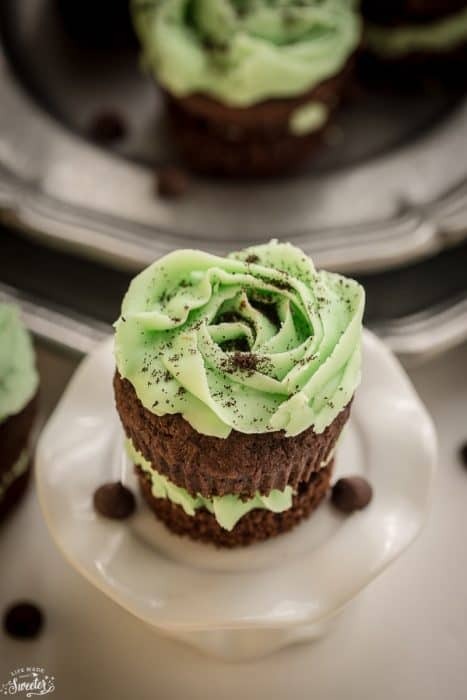 Chocolate Mint Chip Cupcakes are the perfect treat for the holidays. Soft and fluffy chocolate mint chip cupcakes, sandwiched with a creamy mint frosting and topped with Oreo cookie crumbs. Nothing says it’s the holidays like chocolate and mint. It’s one of my husband’s favorites especially when it’s in ice cream form. 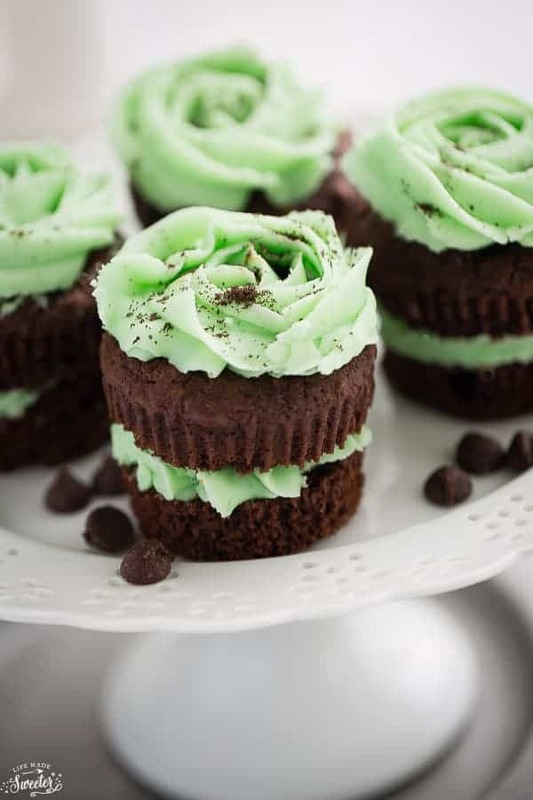 Last month, we were heading to a birthday party and I happened to find out that the birthday boy also had a big crush on this flavor combo so I whipped up these Mint Chocolate Cupcakes to take along to celebrate. 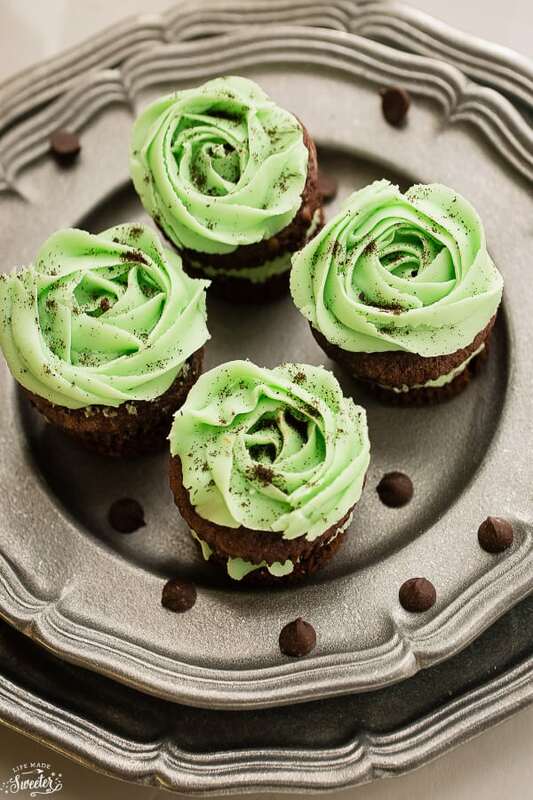 I wanted to dress them up a in a fun way for the guest of honor, so I sliced the cupcakes in half, spread a layer of mint frosting in the middle, piped rosettes on top and finished them off with a sprinkle of crushed Oreo crumbs. 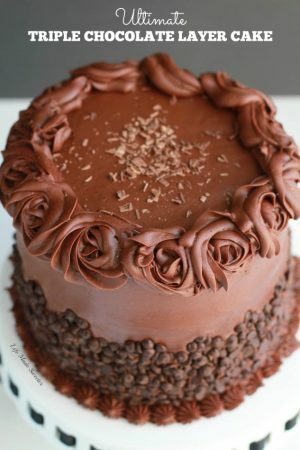 Plus who can say no to double the frosting? The cupcake batter is the same base I used for my Peppermint Eggnog Cupcakes with mint chocolate chips baked inside. 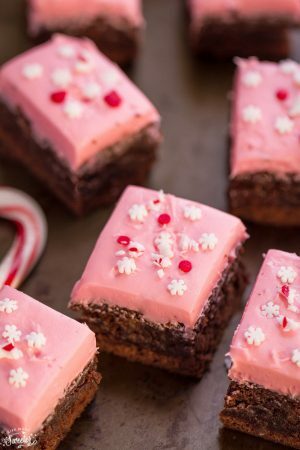 They bake up soft and fluffy with a hint of peppermint extract and compliment the rich chocolate flavor nicely. A generous swirl of creamy mint frosting resembling the beloved ice cream flavor gets piped on and some crushed Oreo cookie crumbs ties everything together. They are fun and easy to whip up and make a cute and festive treat for the holidays. Soft and fluffy chocolate mint chip cupcakes layered with a creamy mint frosting topped with crushed Oreo cookies. Make the cupcakes: In a large bowl, whisk together the flour, cocoa powder, baking powder, baking soda, sugar and salt together. In the bowl of stand mixer or using a hand mixer, beat together the egg, milk, oil, peppermint, and vanilla. Slowly add the flour mixture and beat on medium speed with an electric mixer for 30 seconds. Scrape down the sides of the bowl and continue mixing on medium speed for 1 to 2 minutes. Stir boiling water into batter until well combined. Fold in mint chocolate chips. Divide the batter equally into prepared muffin tin filling to about three-quarters full. Bake for 17-19 minutes or tops are firm and a cake tester inserted in the center comes out clean Remove pan from oven and allow cupcakes to cool in pan for 10 minutes. 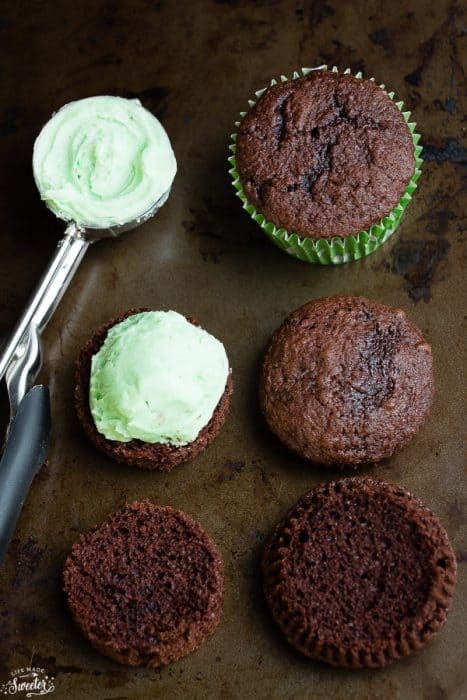 Remove cupcakes from pan and let cool completely before frosting. Add vanilla, peppermint extract and heavy cream and mix until smooth. If necessary, add more heavy cream or powdered sugar until desired consistency is reached.